Beaumont Hospital Dermatology Department Receives Willan Bursary Award. 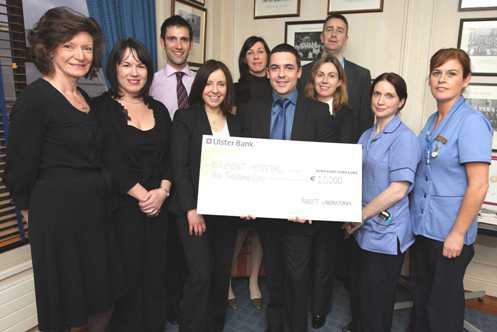 The Beaumont Hospital Dermatology Department recently received the €10,000 Willan Bursary Award. This national award was made to support expansion of the department's chronic skin disease program. The bursary will help fund DAWN 4S software for the service. Dr Marina O'Kane, Consultant Dermatologist and recipient of the award, explains "This is part of a wider initiative to improve the lives of our patients with the most severe forms of chronic skin disease. Those patients on immunosuppressive and biologic drugs who require blood monitoring will benefit most. Integration of this software to our daily practice will reduce risks inherent in the use of these drugs, facilitate nurse-led management of stable patients, improve access for new patients, and provide tools for ongoing audit and research. "In addition, the ability to view disease activity, risk parameters and quality of life scores serially over time will allow objective evaluation of the safety and efficacy of individual patient regimes. The secure, web-based system will interface with current in-house laboratory and patient demographic IT systems to facilitate rapid clinical decision-making independent of paper records." Left to right : Dr Gillian Murphy; Dr Emma Shudell; Dr Toby Gilbert; Dr Marina O'Kane; Dr Saroj Verma; Erwan Guillou (Abbott Labs); Dr Fiona Keane; Oliver Kinlough (Abbott Labs); Nuala Browne, Dermatology CNS; Fidelma O'Dowd, Dermatology CNS.